My youngest daughter’s birthday is in October. I have never made her a card that represented her month of the year. So this weeks challenge theme gave me an opportunity to do just that. First cut a rectangle from white cardstock that measures 5.25″ x 6.75″ then using the stencil from Elizabeth Craft Designs called: S016 – Earth and Sky stencil clouds on the upper third of this rectangle. The picture shows me using this stencil on a different project. I forgot to take a picture of this one. and the edge die that has the barn and trees, tape it to the top of a 2nd piece of white cardstock that measures 6.75′ x 5.25″. Color the barn and trees and the top edges with Copic Markers. Then I used PanPastels to color the rest of this layer. Adhere this layer to the stenciled clouds layer, matching up the two bottom corners. Cut all the pcs. that make up the scarecrow, and the bale of hay pc. I didn’t use the pumpkins from this set. Instead, I used the pumpkins from this set that I just discovered may be no longer available. I cut the stalks out twice, the pumpkins several times to have enough and 3 times for the sunflower pcs. I also cut the vine pc. twice. All these pcs. were cut with white cardstock and colored with Copic Markers. Cut the little fence piece twice. The last element is the “happy birthday” sign. I stamped the sentiment on another pc. of wood grain cardstock and glued it to a leftover pc. that looked like a stake to me. Thanks again for spending some precious time over here! I hope you’ll take this week’s challenge and I’ll see you in October when I will host the blog and have a special guest designer planned. Yes, I’m still making Christmas Cards! If I don’t get started in September, I don’t have enough for what I like to send out. Since my friends know I make greeting cards, they expect a handmade card. Once the season is here there is too much to do to be in the craft room. So here’s how I made this card. The little gold star for the top of the tree was in my stash. The little grass pc. below the mail box is from a discontinued die set. Once you’ve cut, colored and assembled all the little elements for the door scene it’s time to assemble the card. Score a pc. of 8.5 x 11″ red cardstock at 5.5 “, fold over for a book fold and trim to 5.5 ‘ x 7”. Cut a white rectangle from white cardstock that measures 5.25″ x 6.75″ and adhere to the red base. Cut a pc. of “brick” designer paper that measures 5″ x 6.5″ and adhere to the white layer. Thank for taking the time to look at this project. I love to get comments and read every one! C4C -446 National Mountain Climbing Day! August 3, 2018 August 2, 2018 Kathleen Adams2 Comments on C4C -446 National Mountain Climbing Day! Yep, It’s National Mountain Climbing Day! First, let me say you’ll will never get me to climb a mountain. But I do ride a tricycle! My dog rides in the back (pic. on right). Step 1: Cut a pc. of white cardstock in a rectangle that measures .25 x 7″. Using a stencil by Susan Tierney Cockburn called S016 – Earth and Sky stencil clouds with PanPastels 520.5 Ultramarine Blue on the top half of this rectangle. Step 2: I used this die set from Elizabeth Craft Designs called Western Edges which is no longer available. It is a Karen Burniston die set. Cut both the mountain one and the horse one from white cardstock. The mountain one was cut by putting the die at the top of a 6 x 5.25″ white cardstock rectangle and colored with PanPastel’s 780.5 Raw Umber and 250.5 Diarylide Yellow. The horse die was cut from a white cardstock rectangle measuring 5.25 x 4″. I colored the horses with Copic Markers and the rest was colored with the same two PanPastels as the mountain layer but with less of the Raw Umber. The 3 grass pcs. were also cut from scrap white cardstock and colored lightly with the Raw Umber also. The barbed wire was cut from Silver Mirror cardstock. Step 3: Make a base card by scoring an 8.5 x 11″ at 5.5″ and fold over for a book fold card. Now start layering your 3 western edges as shown on top the stenciled “clouds” layer. Add the 3 grass pcs. and the barbed wire pc. Step 4: I created the sentiment by using stamps from this set from Elizabeth Craft Designs: CS077 – Sentiments 2 – Just Because I love both the size and font in this set. Plus, it’s on SALE for 5.95! Thanks so much for taking a look. I love visitors and comments or questions. I hope you’ll take the challenge this week and show us you version of the “Mountain” challenge. I love to find either new or different ways to use my die sets. Let’s face it, they’re an investment. So our intention is that we’ll use it often. However, we live in the real world that often distracts us of our original intention. This die set was one of those purchases for me. I got them on sale or I probably wouldn’t have bought them. That would have been my loss! I just didn’t see how much I would actually use it. I stopped making a big deal out of wrapping presents when the grands were little because they only care what’s inside at that age. Now, they prefer gift cards or cash. Who doesn’t? Here’s a photo of the “Tag” die used last Christmas as tags. I decorated an envelope and adhered it to the back for the $ or card. For this project I wanted to show you how to use this versatile die set to also create a book fold card. In the photo below, I flipped this step over so you can see the fold is taped right next to the blade but not over it. Step 2. Using the die in the photo below from this set, position the die on the front of the base card. Line up the hole in the die with the one in the front of the base. Run through a die cutting machine. Using these same two die pieces, cut one of the top edge pc. and two of the leafy pc. with Olive green cardstock but trim them where the die ends. Now adhere the leafy one to the inside matching all the leaves (start w/the tag hole) and the plain edger one to the other side. The second green leafy one I used on the back of the card. After watching the video, start to assemble the sunflower directly to the card as shown. Cut it out twice, once in yellow and once in green. Glue the yellow on top of the green, offsetting it then adhere to the card as shown. Tie some coordinating ribbon through both tag holes. Good Morning Crafters! For this project for the DiesRUsBlog I wanted to make a “almost any occasion” card. I love the realistic look of Susan Tierney Cockburn’s GardenNotes dies. Over at DiesRUs they carry a huge collection. For this project I chose Elizabeth Craft Designs 1269 Garden Notes Tulip 2 for the star of this card. I also used: 1297 – Garden Notes Ivy Vine I cut both of the pcs. in this die set with white cardstock and then with a Copic Marker I colored green but left white areas to mimic variegated ivy. This die also embosses the cup to show the rim and the curved stripe on the bottom that I colored pink with a Copic Marker. I stamped the pink flowers on the cup with a stick stamp. These stick stamps are fun and are from a company called: Stamps by Judith Visit the site for all kinds of ideas and tutorials using these fun stamp sticks. To assemble the card: Create a base card by scoring a 8.5 x 11″ pc. of white cardstock. Fold to make a book fold and trim to 5.5 x 7″. Cut a rectangle from a designer paper that measures 5.25 x 6.75″ and adhere to the base card centered. Adhere the pink oval to the white oval, then center this oval sandwich to the card. Apply glue to the very bottom underside edge of the cup and place it 1/2″ above the lower edge of the pink oval as shown. Don’t remove the backing paper from the dots yet. Next, play with the tulips and fern until you like it. Then glue the stems in place. Next, remove the backs off the foam dots and apply glue to the underside of the cup handle and all around the cup edges and the back lip of the cup. As you lift the cup back into place, gently push the sides in so that it accommodates the lift in the middle. Thanks so much for taking a look and I hope you will check in with the DiesRUs Inspiration Blog to see what the rest of the team has made for daily inspiration! C4C – 435 Sketch Week! May 19, 2018 May 19, 2018 Kathleen Adams1 Comment on C4C – 435 Sketch Week! My DT card for this challenge is an homage to Romeo and Juliet! Step 1: Make two of Elizabeth Craft Designs: Rose There is an Assembly Video from the designer Susan Tierney Cockburn. Step 2: Make a base by scoring a pc. of 8.5 x 11″ black cardstock at 5.5″. Fold over and trim to 5.5x 7″. Cut a pc. of designer paper 3.5 x 7″ and adhere to the black base card using double sided adhesive as shown. Step 3: On your computer create the two sentiments. Print on cream card stock and cut to 1″ x 3″. Distress the edges with Black Pan Pastel. Then I hand cut the fishtail. You could also use fishtail dies. Step 4: Add the assembled roses and sentiments as shown. I really appreciate the time you took to take a look. I just love the floral dies by Susan Tierney Cockburn For Elizabeth Craft Designs. I’m not going to mislead you. They all take some time to make but worth the effort! Here’s the link to Susan’s assembly video. I recommend you watch the videos before you attempt to make most of her floral die sets. It’s not always obvious how to put them together and it will save so much frustration! 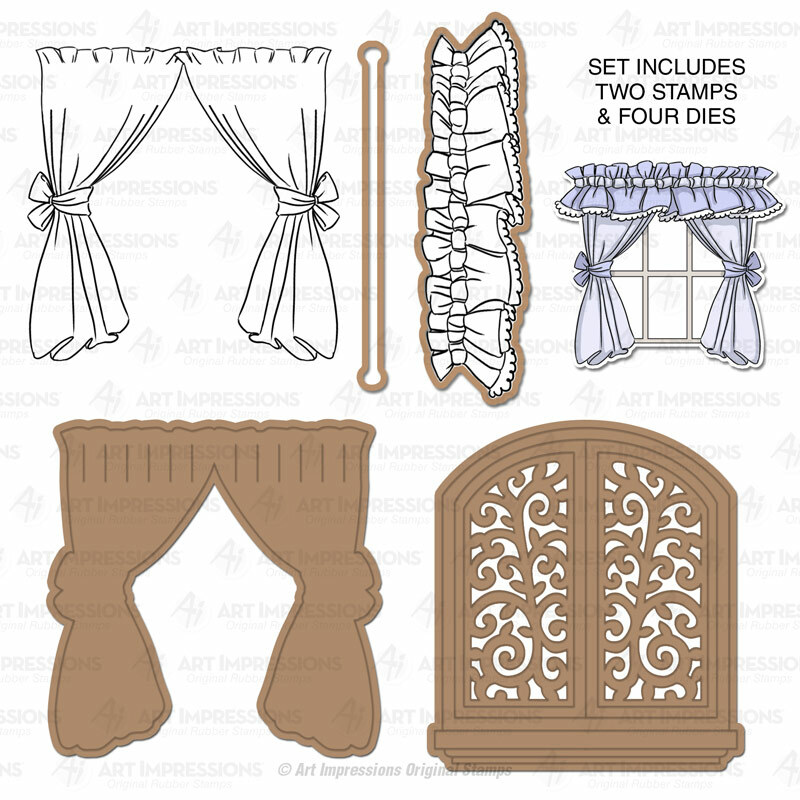 Step 1: Die cut all the pieces out from the 1487 – Garden Notes – Lilac 2 die set and assemble the lilac. I cut both petal pc. dies from a dark lavender cardstock about 6 or 7 times because I like a full lilac. If I don’t use them all I put the leftovers into the die set envelope so I don’t have to cut as many times the next time I make it. I cut the leaves from green cardstock and distressed the edges and the center vein with a little purple ink. Cut the teacup and saucer pcs. I had tried a technique I learned from one of Els Van de Burg’s Technique Friday videos to put several different colors of ink on a craft mat and then spray water on it. You then take cardstock and start picking up color as you turn the cardstock. I used pretty intense colors because I wanted to stamp over it with a large background stamp in white. It didn’t work out for what I wanted to do but it made an interesting paper for this tea cup set. I wish I had taken a pic of the paper before I cut it out but didn’t. Here’s a pic of the rest of the paper after I cut it out. I cut the saucer from another lavender cardstock. Step 3: Using the 1064 – Fitted Frames 4 Curvy Squares, cut once with white cardstock and again with purple cardstock. You will use the largest white frame and the second to the largest in purple. Step 4: Cut a 4.75″ square from light lavender cardstock. Cut a 5.75 square from color coordinated cardstock. I chose a lavender polka dot cardstock from ModaScrap – “Thinking about Polinesia” also available at Elizabeth Craft Designs. Step 5: Make a card base by cutting an 12 x 12″ piece of white cardstock in half. Score one half at 6″ and fold over. You should have all the elements now to make this card. Step 6: Assemble the card. Adhere the lavender ModaScrap square to the base card. Adhere the 4.75″ lavender sq. centered next. Then adhere the white curvy square over the lavender one. (it also measures 4.75″) Next adhere the purple curvy sq. inside the white one matching up the curves. Step 7: Adhere the saucer, teacup, lilac and leaves as shown. Step: 8: Using this die from Die-Versions cut mom from purple cardstock. Adhere the “Mom” to the little tag. Cut a little pc. of Bakers Twine and attach the tag to the handle of the tea cup. Thanks so much for stopping by for a look. I can’t wait to be able to count on warm weather! So my card today is a nod to Summer! What screams summer more that blue gingham and red Geraniums. This card could be used for any occasion by just using a different sentiment. Step 1: Cut all the petal pcs. 3 times for each flower. (run these pcs. 3 times through your machine with two layers of red cardstock. Cut the leaf pcs. 3 times with two layers of green cardstock. Add a little of 340.5 Permanent Red PanPastel to the edges of the leaves. Assemble the 3 Geraniums by shaping and gluing. This video shows the geranium being assembled directly on your project which is great but not for this project. Assemble each flower and you will slide them into and onto the Gathering basket. Step 4: Create a base card by scoring a 12 x 12″ pc. of white cardstock at 6″. Fold at score line and trim to 6 x 6.5″. Cut a rectangle that measures 5.75″ x 6.25″ from blue gingham cardstock. Adhere, centered, to white base card. Now adhere the red scallop oval, centered onto the blue gingham layer. Next start auditioning your flowers, petals and little blooms into and onto the basket until you like what you see and glue in place. Ink the edges with light blue ink and adhere to basket. You could also use a small tag and bakers twine and attach to the handle. C4C – 429 Use your dies as stencils! April 7, 2018 April 3, 2018 Kathleen Adams3 Comments on C4C – 429 Use your dies as stencils! Well, this was a fun challenge theme because I got to use what is clearly becoming my favorite 2 die sets: Happy Frame and Happy Frame XL by Elizabeth Craft Designs . Step 1: Using the Happy Frame XL die cut 4 times with heavy weight white cardstock. The photo above shows the 730 – Curvy Leaves die set, the stencil I made and another piece of a double sided adhesive I tried this die first as a stencil (that’s why it has ink on it) and the practice piece of cardstock that’s 1″ wide like the Happy Frame is. This is the assembly video link: Happy Frame assembly video. Step 4: Size, print and color with Copic Markers this digital stamp from called “Sunflowers” Di’s Digi Stamps. Trim the colored print centered in a 6″ square. I then went over the print with the same very light touch of Raw Umber PanPastel. Step 6: Add 10mm (1/2″) Clear Double Sided adhesive to the edges of your 6″ colored image square on the colored side. Now attach it to the back of the frame. If you are going to stamp a sentiment on the inside, do it now. Step 8: Add Clear Double Sided adhesive 10m to all four front edges of your card base. Adhere the frame to the card. Thanks so much again for having a look. These frames are so fun. And come back next week for another fun challenge! Please let me know you were here by leaving a comment. I love to read them! Elizabeth Craft Designs: Soft Finish Cardstock 12 x 12 Dove Gray and 8.5 x 11 white, 10mm Clear Double Sided Adhesive.